Mars Express encountered Phobos last night, smoothly skimming past at just 67 km, the closest any manmade object has ever approached Mars' enigmatic moon. The data collected could help unlock the origin of not just Phobos but other 'second generation' moons. Something is not right about Phobos. It looks like a solid object but previous flybys have shown that it is not dense enough to be solid all the way through. Instead, it must be 25-35% porous. This has led planetary scientists to believe that it is little more than a 'rubble pile' circling Mars. Such a rubble pile would be composed of blocks both large and small resting together, with possibly large spaces between them where they do not fit easily together. Last night's flyby was close enough to give scientists their most exquisite data yet about the gravitational field of Phobos. Mars Express locked onto the radio signal from Earth at around 21:20 CET (20:20 UT). The radio frequency oscillators on the ground are 100 000 times more stable than those on the spacecraft, so for this experiment, which required the best precision possible, the signal was sent up to Mars Express and then returned by the spacecraft to the ground. Now that the data are all collected, the analysis can begin. First will be an estimate of the density variation across the moon. This will tell scientists just how much of Phobos' interior is likely to be composed of voids. "Phobos is probably a second-generation Solar System object," says Martin Pätzold, Universitat Koln, Cologne, Germany, and Principal Investigator of the Mars Radio Science (MaRS) experiment. Second generation means that it coalesced in orbit after Mars formed, rather than forming concurrently out of the same birth cloud as the Red Planet. There are other moons around other planets where this is thought to have been the case too, such as Amalthea around Jupiter. Whatever the precise origin, Phobos will eventually crumble back into this disrupted state. It is gradually spiralling towards Mars and will eventually be pulled apart. "It came from debris, it will return to debris," says Pätzold. In the meantime, it is there to be studied and explored. Last night's flyby was just one of a campaign of 12 Mars Express flybys taking place in February and March 2010. For the previous two, the radar was working, attempting to probe beneath the surface of the moon, looking for reflections from structures inside. 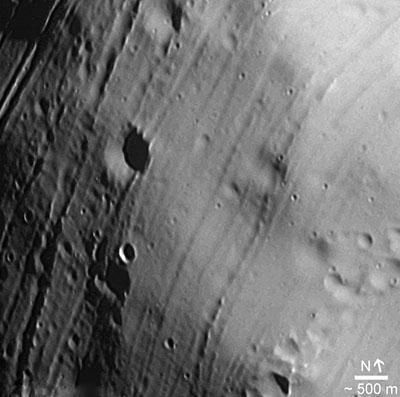 In the coming flybys, the Mars Express camera will take over, providing high resolution pictures of the moon's surface.